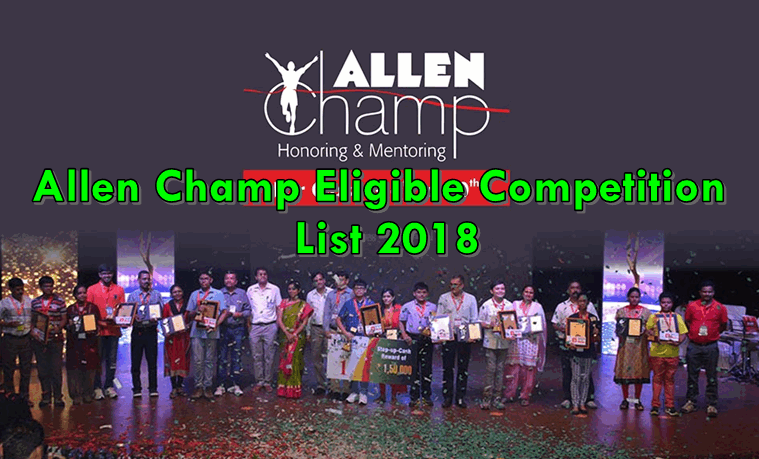 ALLEN Champ Eligible Competition List 2019 is for the students who want to participate in the ALLEN Champ 2019. ALLEN Career Institute has taken an initiative as Allen Champ 2019 to recognize, honour and mentor the students of class 3 to 10 who have at least one achievement from the Allen Champ Eligible Competition List 2019 given on this page. The ALLEN Champ Eligible Competition List 2019 can be very helpful for the students desired to receive rewards from ALLEN Career Institute through Allen Champ 2019. ALLEN Champ is an initiative taken by the ALLEN Career Institute for the school students of class 3 to 10 who are already recognised being the winner of any of the Allen Champ Eligible Competition List 2019 given on this page. The following are the ALLEN Champ Eligible Competition List 2018; the students can check the name of eligible completion in it so they can apply for ALLEN Champ. State Science Talent Search Examination (SSTSE) - By Rajasthan Govt.